Express Oil and Gas has made a bold statement of confidence in the future with further investment at its Gateshead facility. The Team Valley-based company has acquired an additional Mazak INTEGREX i-400 multi-tasking machine tool which will form part of a new manufacturing cell producing valve components for the oil and gas sector. The new machine will combine the operations of two existing machines into a single process, offering an immediate and significant production improvement. 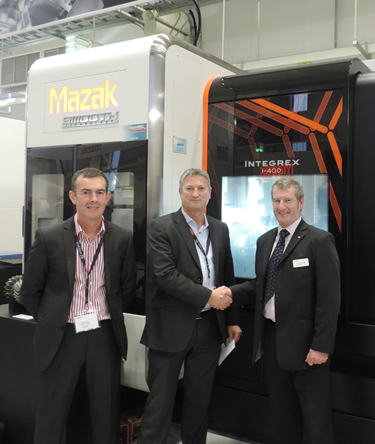 Express Oil and Gas has a long history with Mazak and, as recently as 2014, acquired an additional number of very large multi-tasking centres, including the first INTEGREX e-800 series machine to be installed in the UK. Neil Ransom, Commercial Director at Express Oil and Gas commented: “We have a longstanding policy of continuous improvement in our manufacturing operations and are constantly analysing our production processes to reduce costs wherever possible. He continued: “The INTEGREX i-series is our flagship multi-tasking machine and the new manufacturing cell is a classic example of Mazak’s DONE-IN-ONE machining philosophy, which aims to streamline production processes by reducing the number of machines and set-ups required to make a component. "We worked closely with Express to develop a new more efficient approach to machining an existing core product, which has helped them maintain margins, whilst satisfying end-user demand for unprecedented cost-reductions.